Screenshot via @TuckerCarlson/TwitterTucker Carlson on Tuesday night. Fox News commentator Tucker Carlson is under fire on Twitter for a segment lamenting demographic changes in America on his show Tuesday night. An Obama administration aide called Carlson “racist” for the segment, and several other prominent Twitter users joined him. 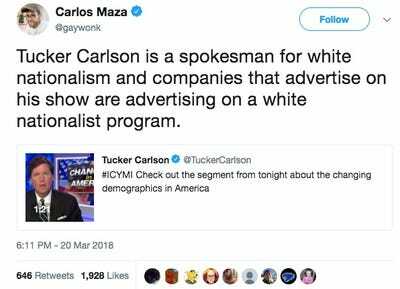 Conservative Fox News commentator Tucker Carlson is catching flak on Twitter for making what some are calling “racist” comments about how quickly America’s racial makeup is changing. Tucker ran a segment on his show Tuesday lamenting the “bewildering” pace of demographic changes in America, and pointed to the case of Hazelton, Pennsylvania. “How would you feel if that happened in your neighbourhood?” he asked his 3 million viewers. 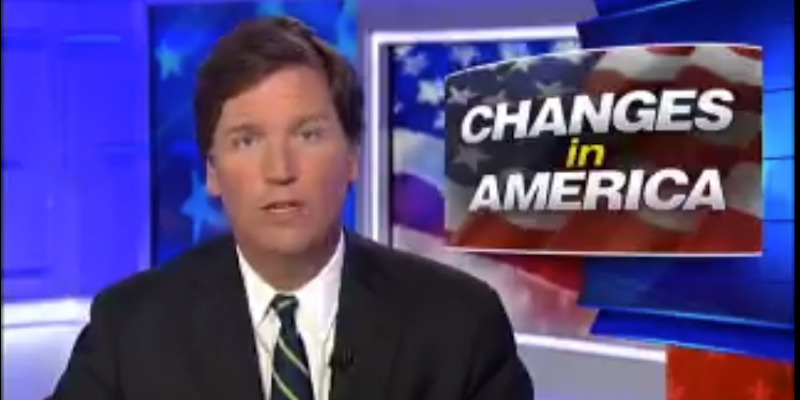 Carlson denied that this was a “bigoted” assertion, and said he was merely pointing to a quick pace of change in the US. “No nation, no society has ever change this much, this fast,” he said. He later appeared to blame immigration and the subsequent racial change for America’s socio-political instability. But Carlson’s comments immediately attracted rebuke from Twitter users, including former President Barack Obama’s White House communications director Dan Pfeiffer. 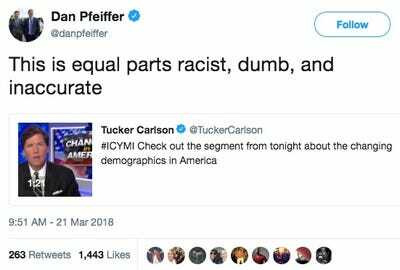 “This is equal parts racist, dumb, and inaccurate,” Pfeiffer wrote in a tweet sharing Carlson’s clip. Businessman and one-time Congressional candidate from Wisconsin Khary Penebaker accused Carlson of racism less directly. “I’n [sic] not a racist or a bigot. BUT…” Penebaker’s sarcastic tweet read. Several journalists, including Vox’s Ezra Klein and Carlos Maza, also tweeted about the segment. Senior writer at Rolling Stone Jamil Smith, who is African-American, added his own spin to Carlson’s narrative. “Ask black folks in Harlem,” Smith wrote, responding to Carlson’s rhetorical question about how people would feel about demographic changes in their neighbourhoods. This is not the first time Carlson has come under fire for making racially charged comments about race in America. Prominent white supremacist Richard Spencer and former Grand Wizard of the KKK David Duke are reportedly big fans. Carlson has expressed a fondness for American demographics of days gone by in the past, as well.